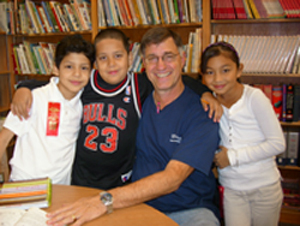 First Church supports two vital partnerships with neighborhood schools in our area. The Park partnership provides support to our neighborhood children attending Park Elementary School, located on North Main near the church. We supply a variety of school supplies and school uniforms, assist and support the Park Staff with programs and activities, and help raise student achievement and self-esteem, partly through a tutoring and mentoring program. Over thirty First Church members are directly involved with Park students every week through this tutoring program. First Church also supports Washington Elementary, at Central and Pennsylvania. At Washington, we support activities to bring families into the school for educational and community events. First Church is also active in supporting the Washington staff in a variety of ways. First Church Park Task Force oversees this partnership, and Libby Eaton, First Church Director of School Partnerships, is the liaison between the church and the school principals, counselors and other staff. Revenue to support these projects comes from the Tip Jar at Mead’s Corner, the church’s coffee house located at Douglas and Emporia.